The word “utopia” entered the lexicon a long time ago and today it of course denotes an ideal frictionless social system where all are able to live in the greatest possible happiness in perfect harmony. Most people know that it is the title of Thomas More’s 1516 book and that it literally means no-place — there are many Greek puns in the text which itself, and surprisingly few people seem to know this, was written in Latin. The name usually conjures up images of a place so perfect it cannot exist in real life and yet is something we all should strive for. From this it is obvious that most people have not read More’s faux travel-narrative which, in short, is a story narrated by someone called Raphael who explains the habits and customs of the Utopians in the manner of a proto-Gulliver. It is a horrible place to live in if you are a woman and it’s not much better if you are a man. More was a religious nut at a time when this was a particularly difficult thing to accomplish and he eventually died for his beliefs. He refused to recognize Henry VIII’s nookie-hunt-inspired innovations and lost his head for it, probably quite happily too. His ideal society reflected his rigid beliefs resulting in the book which has been called the first work of fiction in the English Renaissance. It’s also often said that More’s Utopia is some sort of proto-Communist tract, but I would think it unfair towards Marxist materialism to go along with that. The modern reader will perhaps see More’s Utopia as a place closer to an Orwellian society reinforced with Foucauldian self-disciplining mechanisms. Which is to say it’s not much fun at all. My point is, it’s very difficult to find anything nice to say about the world More created, but seek and ye shall find. At least as horses, More writes, they’d lead much happier lives where they wouldn’t have to worry so much. It is a typical social inequality rant some bushy-bearded pinko could belt out even today for the simple fact that it is still true today. Horses are fairly dumb animals, but there is a tinge of nobility in them anyway. If only they had the good sense to act according to their potential and be the creatures Swift made of them. This line of reasoning has many avenues to explore, but I have to stop here for now because it is quite late. I will not pun about leading horses to water and letting them go about their business, but I would like to say that using the word “utopia” in its common sense becomes much more interesting after one has actually read More’s book. There’s something very frightening about Lewis Carroll. It is as if he had noticed the horrible misuse of Swift’s Gulliver’s Travels as a children’s book and wanted to write a story which would somehow smuggle in the relentless misanthropy of the last chapter of that fantastic work — the one where it’s not a matter of being delightfully big or small or among delightfully strange people but noticing the barbarity of one’s own culture and self. The censors who enjoyed chopping off that little bit had to be fooled somehow, so Carroll used wit (or some semblance of wit) and his pitch black sense of humor to do just that in Alice’s Adventures in Wonderland. By a little tweak of the subject and Watts’s moral perspective Carroll turns this poem on its head and creates something quite subtle, but it’s devastating nonetheless. The little tale of the busy bee has been turned into a description of a predator doing what predators do best. It is not the case that the moral tale of being good and industrious has been soiled by parody and made into a story of evil. The question of morality is there, but in a very different form. Crocodiles do what they do because they are crocodiles, and bees sure as hell do not get moral satisfaction from their work. Someone stuck on a factory assembly line works hard, too, but it would be strange if they sustained their faith in the meaningfulness of their work every day until the day they die. We find satisfaction in the mundane repetitiveness of work not because it is rewarding in itself but because if we didn’t we would see it devoid of its moral qualities. We make up things such as “I’m happy that the toys my company makes bring happiness to children” or that “My input on the production line contributes to the economic growth of my country and hence the welfare of its citizens, my countrymen.” Carroll scorns our lot in unspeakable ways. It is this terrifying wit (not the Disneyfied versions of his books) we should celebrate nonetheless, because it at least tells us that we make up excuses for our happiness, our own little morality tales, because we have to. Or maybe I’m reading too much into it. Spending too much time with books will make you do that, which is something Watts also forgot to mention. Moon Under Water posted an interesting piece about the grotesque and satire today and this gave me the idea to plug a book called The Grotesque and the Unnatural that came out recently. In fact, I got my copy just earlier this week and it looks very impressive. 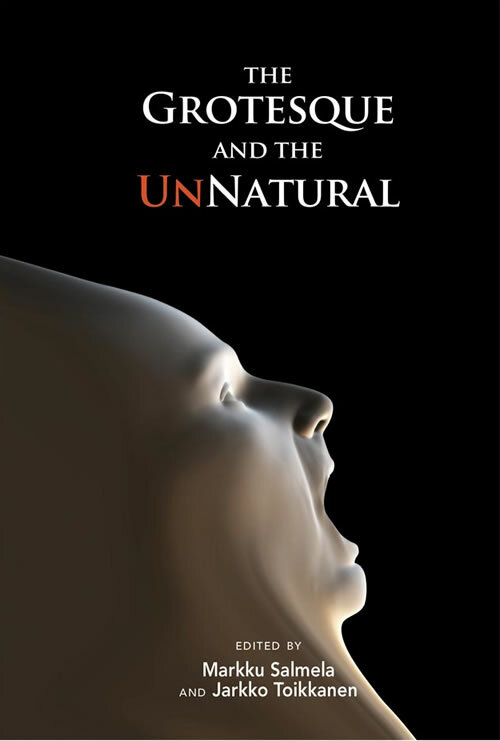 The book contributes to current discussions on the grotesque in contemporary literary and cultural theory from the perspective of one specific motif: the unnatural. Quite like the grotesque, observing the unnatural (and unnaturalness) reveals a resilient strain in critical thought, and the significance of this history gradually unfolds as the volume charts the progress of its main themes from the Renaissance to the present day. While in much current talk about theory and criticism certain related notions are still posited for and against each other––what is seen as normal or natural and what is not, and what should be seen as normal or natural and what should not––the discussions in The Grotesque and the Unnatural go a long way toward founding a new vista from which to observe this beguiling opposition. It includes a number of essays that look at the grotesque in relation to the unnatural and focuses on the slipperiness of the slippery concepts. The editors, two lovely beardy fellows from the University of Tampere in Finland, did a great job in gathering together different approaches to a difficult topic in a way that will hopefully illuminate various aspects of the grotesque without emptying it of its transgressive power. As Ruskin already saw, we need to maintain that friction and potential for terror in order not to destroy the concept under examination. In other words, to examine the grotesque without domesticating it. That, in a nutshell, is what I think makes this book interesting. And the cover, too. The front cover is pretty awesome. A Reuters story caught my eye this morning. The headline was Migraine often associated with psychiatric disorders and the brief summary told me that a Canadian team of researchers had done a study that indeed linked migraines to various mental health problems. Because I do get migraine headaches that can sometimes be quite severe, I decided to take a look at the article mentioned by the Reuters story and went to the journal Headache: The Journal of Head and Face Pain — that name is hilarious and ominous at the same time. The key findings of this study are: (1) Migraine is more than twice more common in females than in males, and is most common in those aged 25-44 years and in those of lower income. (2) Migraine is associated with MDD [major depressive disorder], bipolar disorder, panic disorder, and social phobia, all occurring twice as often in those with migraine compared with those without it. However, migraine is not associated with drug, alcohol, or substance dependence. (3) The higher prevalence of mental health disorders in migraineurs is not accounted for by sociodemographic variables. However, psychiatric disorders are less common in those over 65 years, in those who are in a relationship, and in those of higher income whether migraine is present or not. (4) Antidepressant and antiepileptic drug use is generally highest in those with migraine and a mental health disorder, intermediate in those with a mental health condition but without migraine, and lowest in those with migraine alone or neither condition. (5) Health-related outcomes are poorer in those with both migraines and a psychiatric disorder than in those with either condition alone. So there’s depression, bipolar disorder, panic disorder, and social phobia. I don’t think I’ve been that severely affected by any of these, but I can certainly see how it would be possible to even have some of these as symptoms from migraine attacks. My own migraine is the common kind: no aura, hypersensitivity to light, sound, and smells, nausea, and of course a splitting headache. The headache goes away with painkillers, the other symptoms not so much, and I am completely useless for twelve or so hours if the attack is severe. The next day is spent in a pleasant haze of pain-free euphoria which can actually be quite nice. I’ve spoken with people with much worse migraines, so I can’t complain too much, but it does have on an effect on the way I go about my daily business. Another weird article I picked up when I searched the Reuters site was a piece titled Headaches linked to painful skin sensations. Cutaneous allodynia is a fancy term for this sort of sensitivity to touch and it seems to mesh well with other kinds of hypersensitivity that occur with migraines. Bipolarity and depression are much more severe things and I wouldn’t dream of talking about them as symptoms of migraine. However, it’s not a big leap from these hypersensitiveness symptoms to panic attacks and social phobias. Imagine going out and confronting a world that has been turned up to eleven and trying not to panic in that cacophonous confusion. Add to this what we might call semantic noise — people talking, signs, newsstands and headlines, traffic lights, etc. — and there is a good chance that all this becomes overwhelming. You are like a raw nerve walking the streets and it seems to make sense to escape as fast as you can. It’s not madness, it’s the reasonable thing to do. Last night was frightening. During the day, I noticed that I was getting a bit hyper, a sure sign of the onset of a migraine attack — it’s usually a bit like getting drunk and then having a severe hangover. I thought I’d do a workout and sweat it off, as if that ever worked, and after I was done and sure there was no way to stop the headache without chemical intervention, I discovered that I was all out of drugs. Not even an aspirin was to be found in the flat and it was too late to go out and get some. This meant riding out the peak of the attack in darkness and quiet, which I did and even managed to doze off for a few minutes. After that was over, it became apparent that the rest of the night would be sleepless, at least to the point where the headache subsided enough to allow me to relax. At one point my ears rang for an instant and the noise was accompanied by an associated color. This seemed odd, so I thought I’d experiment with these synaesthetic perceptions a bit. I tuned my guitar to A440 and tried out different colors and their corresponding notes just to pass the time. Turns out, A gave out a gray color, G green, E blue, and so on. I had heard of a trick that some people who claim to have perfect pitch use, focusing on the feeling that one gets in one’s vocal apparatus when humming a certain note, but that was useful only for ballparking the note. The colors turned out to be more accurate, and as my relative pitch is fairly good, it was easier to get matches through them. This morning, after I had managed to sleep a couple of hours more, the headache was still faintly present and I decided to give this synaesthesia business another whirl. Surely it was just a fluke or self-suggestion, I thought. But the colors were still there, somehow, especially Bb and G, brown and green, both very pleasant and welcome sensations after a rough night. So, I turned on my Tetris game, the only game I usually play on my computer, and started humming the little blocks as they fell. After a few blocks, a lovely brown one appeared and soon after a green one showed up. I checked the notes on the guitar and noticed I was a semitone too high, which was very odd since B had given out a brilliant white during the night. That’s it, I thought, what a moron you are thinking you can actually color sounds. However, I did give myself the benefit of the doubt, checked the tuning on the guitar, and found that it was actually nearly a half step flat. The strings, unaccustomed to the higher concert tuning they had just been forced to assume, had stretched just enough for me to think that I was sharp. I was right, my measuring instrument was wrong. According to the internet, almost every single person in the known universe claims to have synaesthesia, so I don’t want to say that about myself. Nor do I want to compare color palettes with anyone, or be tested on these things. But I will say this much: when I am having a migraine attack, I see notes as colors quite easily. On the minus side, when I am having a synaesthetic migraine attack, I’m not much good for anything else than looking at the ceiling and humming colors into the darkness. A few years ago I had a French tutor who made me write poetry and after a few tries I was able to produce two poems he actually seemed to like. He called them “sympa.” That’s good enough for me to post them here. It’s not Baudelaire or anything, but it was the best I could do back then. The first assignment was to write something about an everyday object, the second was to have something to do with Plato’s allegory of the cave for reasons I won’t go into here. The first one has the benefit of accommodating a number of nasty interpretations. The second is about a bee that wanders into the cave. Une tasse, un peu tachée, inutile sans l’eau noir. Sans aucun intérêt, à son côté me voir. Il me dit:”Hé Ady, qu’est-ce qu’on fait maintenant”? “Il n’y a plus rien à boire, j’y vais dans un instant”. “J’aimerais que tu restes, tu ne dois pas partir. Un autre café noir, trouves quelque chose à dire”. “J’ai rien de plus à dire, ma petite tasse bidon. J’ai bu ton offre amer, j’ai mangé le bonbon”. A se laissé passer et a volé à nous. Elle a un corps et plus: Nous nous retrouvons fous! Car nous sommes libérés par cette petite abeille. Et toujours enchaîné nous voyons le soleil. Malheuresement l’abeille a oublié les clés. Liberté à penser, c’est bien un truc fermé.